Fun To Do Ultra High Resolution Clear resin for 3D printers. 3D printing resin Fun To Do Nano Clear. Today’s High End printers equipped with high precision mechanics and high end optical Light engines are capable of so much higher resolutions than the current available resins can provide them. 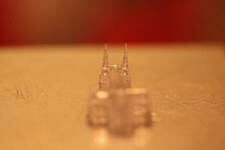 Although Nano Clear is especially a product targeting the high end market, also the other end of the printer spectrum can benefit from this high resolution resin. Although the mechanical and optical limitations of common LCD machines, like the D7 and the Photon, won’t bring out the best of this resin, these machines can also benefit from the magnificent properties of Nano Clear. To clean and remove excess resin, agitate the 3D printed part in an ulkltrasonic cleaner with TEK1969 cleaning or in a simple vat with TEK1960 solvent for 1-2 minutes. More information is available at FunToDo.